So, what are the upgrades this time? 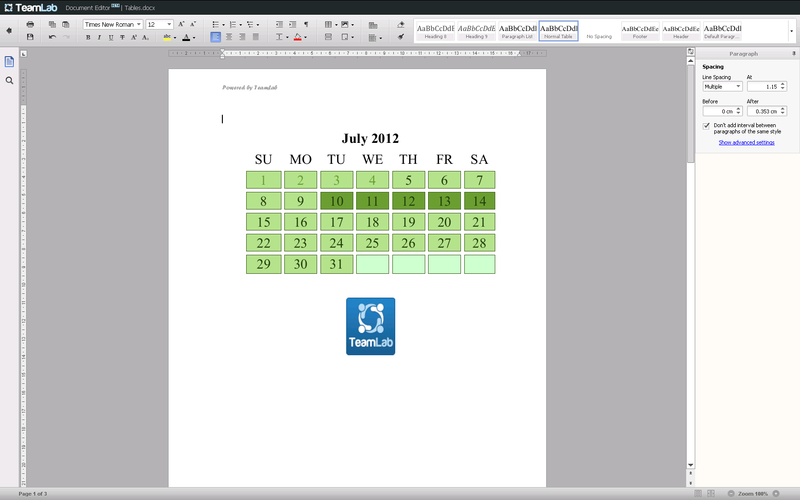 A new TeamLab Document Editor. It surpasses the previous one both in the features range, operation speed and fluency of work. To be honest, we’re proud of the new TeamLab Editor as its technology gets ahead of the approaches commonly used in online document processing. We hope you’ll estimate the upgrade at its true value and as usually we’re waiting excited and curious for your feedback at support@teamlab.com, Facebook, Google+ and Twitter. Please note that TeamLab Document Editor has been released in beta version and shows the best possible performance in Google Chrome. I hope updates can be done for excel sheets too. TeamLab documents does not recognize excel perfectly since most data are lost when uploaded. We also cannot use filters, freeze panes, and such. Otherwise, please let us know how. Maricel, concerning your problem of lost data, please write to support@teamlab.com. As for this new update, we’ve upgraded the spreadsheet viewer while the editor will be improved later. Thank you very much for this upgrade! We had some troubles editing word documents in Spanish: the accents were displayed incorrectly, but with this new update there is a wonderful interface and the coding now is perfect! Jean, great to hear your positive feedback. Thank you! Спасибо за редактор. Отличный интрефес и возможности. Единственная проблема – время загрузки страницы при запуске вьюера или редактора увеличилось в несколько раз. Превращается в проблему при не очень хорошем соединении. Илья, при первой загрузке документа идет его конвертация в формат нашего редактора. В следующий раз загрузка этого документа уже не займет столько времени, т.к. он уже был сконвертирован. Мы постоянно работаем над повышением скорости работы c TeamLab Editor, в будущем среднее время загрузки документов сократится. como puedo editar un documento excel con la nueva version de teamlab? Это обновление для SaaS версии или для серверной версии TeamLab? Alex, обновление для SaaS версии. In my installation, which is version 5 I think, there is no online document editor present (Server edition). How can I get this option? The TeamLab Document Editor is available within the SaaS version only. Is it a temporal limit? In the current version of the editor there’s a limit. But with a next coming release this limit will be removed. Wow! This is awesome. I’m surprised this hasn’t gotten more attention and press. It totally blows away Google Docs and Microsoft Skydrive/Webapps/whatever. Thank you so much for your feedback! We hope to get more social buzz later, as we’ll announce the next version of our Editor. I have been online trying to find a project management software program that would help me deal with my organization and momentum issues regarding the writing and completion of my thesis for graduate school. While I loved some of the beautiful, popout GUI and colorization of other similar cloud utilities and their “risk” and “issue” and “ideas for mitigation of risks/issues” capabilities, I’m going with TeamLab. So can I just say: Wow, TeamLab developers!!!! Good document editing in the cloud so that I can bypass downloading? Really? Really!?!! OH. MY! Yes, yes, yes!!! I am sold since . . . This is in addition to features such as the: milestones feature, calendar, timer (so that one can log hours and learn more about one’s patterns, process, and prioritization/effort needs, time dispersal needs, etc. ), ability to list out all tasks and subtasks, commenting ability . . . I think this might help a lot. And this all works and comes together for my needs ONLY because the online editor rounds out these features. I’m so glad Teamlab exists. I have shared with friends how TeamLab helps me stay on track as an academic researcher-writer.